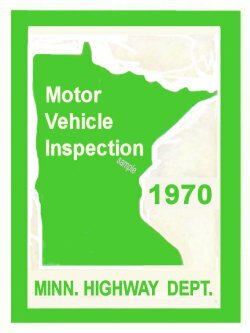 1970 Minnesota INSPECTION Sticker - $20.00 : Bob Hoyts Classic Inspection Stickers, Add a Final Touch to your Restoration! Minnesota had random spot checks and issued stickers to show the car was approved. This 1970 Minnesota inspection sticker was restored and reproduced directly from an original front and back. It has our patented "Peel and stick" format which allows the sticker to be placed on the inside windshield. We will pay $25.00 for any original inspection sticker not posted on this web site. We will also include a free reproduction of your choice. We will also exchange a free repo for any scan or photo you send us, both front and back, not posted on this web site.